Correction: This article originally referred to the closing date of Yellow Face as March 9. The production ended on February 23. We apologize for the mistake. I had Theater J’s production of Yellow Face in my crosshairs ever since they first announced it would be a part of their 2013-2014 season. It sounded like a natural follow-up show to Signature’s Miss Saigon which I reviewed this past fall. The David Henry Hwang piece is a “based on true events” biographical tale of his life advocating for Asian American actors in the wake of the “yellowface” casting of Jonathan Pryce in the Broadway production of Miss Saigon in the early 90s. With that premise I knew that racial themes would be a big part of the piece, especially when Theater J invited me to speak on a panel about the subject. However the show was much more than I originally expected. It’s a highly entertaining yet poignant story about the Asian American struggle as an invisible minority despite their reputation as a model minority. Just as films like 12 Years a Slave and Fruitvale Station are being touted as important films of the past year for their racial themes, I feel that the exploration of race in Yellow Face is important enough to say that this is one of the most important shows to see right now. The show sees David Henry Hwang (Stan Kang) fresh off his Tony win for M. Butterfly speaking out against the controversial Pryce casting. The issues from the controversy are heightened in hilarious fashion as Hwang finds out that the Asian lead he casted in his upcoming production is actually white. The show also touches upon Hwang’s family life as a first-generation Asian American as well as events of the time, such as the Wen Ho Lee indictment during the Los Alamos information leak investigation. Director Natsu Onoda Power assembles a cast (Tonya Beckman, Mark Hairston, Brandon McCoy, Sue Jin Song, Al Twanmo, Rafael Untalan, and Jacob Yeh) that works well together. Several cast members play “color blind” roles, such as Song playing Lily Tomlin, which only deepens the show’s themes of race and identity. 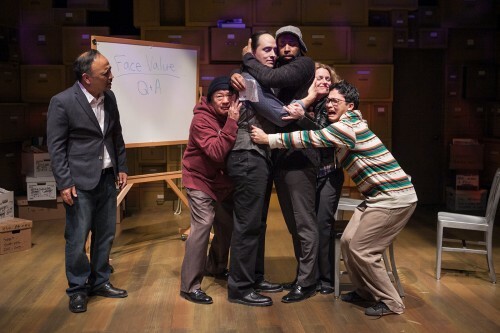 While on the surface it may sound out of place for Theater J to put on a show focused on the Asian American experience, the idea of cultural identity is one that applies to not only Asians but Jews, African Americans, and any minority living in America today. Sure, you can suspect by my name or appearance that I am a fan of this production, however what makes this show great is not only the entertaining yet striking presentation of an oft-discussed diversity issue, but a more universal message that doesn’t hit the audience over the head. I tip my hat to Theater J for not only thinking outside the box with the selection of this show for this season, but for putting on a well-done production that everybody should see while they can. Yellow Face performed through February 23, 2014 at Morris Cafritz Center for the Arts, located at 1529 16th Street NW, Washington DC 20036. Closest Metro stop: Dupont Circle (Red line). Tickets start at $45. For more information call 202-518-9400.